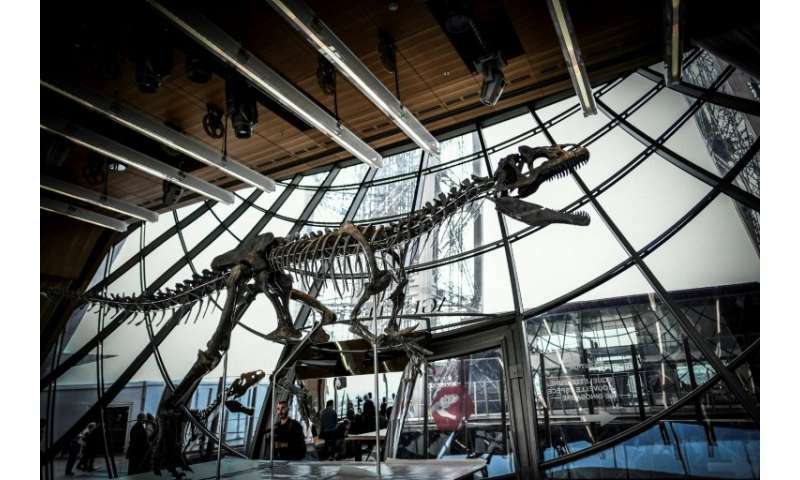 The 150-million-year-old skeleton, which is 70 percent intact, was snapped up by an unnamed French art collector, who promised that the specimen will be lent out to a museum. The skeleton of an extremely rare form of dinosaur sold for more than two million euros ($2.3 million) at the Eiffel Tower in Paris on Monday. The bones of what scientists believe to be "probably a new species" of the carnivorous allosaurus were discovered during a dig in Wyoming in the United States in 2013. The dinosaur, which is more than nine metres (30 feet) long and 2.6 metres high, lived during the late Jurassic period, said Eric Mickeler, of auction house Aguttes. He said it was the "only one of its species" to have yet been discovered. Dinosaur expert Eric Geneste had earlier told AFP it was impossible to "classify the skeleton yet as a allosaurus" because it was more robust, "with longer shoulder blades and a different number of teeth". "In fact there are as many differences between it and an allosaurus as between a human and a gorilla," he added. Japanese and Swedish telephone bidders also tried to buy the dinosaur, pushing the bidding above the 1.8 million euro estimate. The same French auction house sold an allosaurus called "Kan" for 1.1 million euros in 2016. Mickeler said that "herbivores do not quite excite businessmen who buy dinosaurs the same way as carnivores do. They want to buy carnivores like themselves." Part of the proceeds of the sale of the skeleton by a British collector will go to towards funding further archaeological digs.